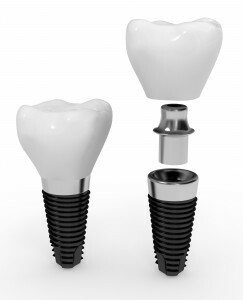 Dental implant surgery requires careful, precise planning. Any tool that can make the process easier and more trustworthy is a valuable asset. That’s why, as your Randolph implant dentist, Dr. Goldstein has invested in specialized implant planning software from 360imaging. Using 360imaging in combination with his CT scan machine, Dr. Goldstein can create a detailed 3D model of your teeth and virtually place your implants on the computer. From that, a guide is fabricated that is used for precise placement of your implants. This takes all the guess work out of the placement and ensures a more rapid and predictable result. That means you can show up for your procedure feeling more comfortable about your surgery, as well as the rest of your procedure. Why is planning an implant surgery so important? Because your implant posts are the foundation for your new smile. Once inserted, your implants will become a natural part of your jaw. To make sure that you achieve the best results possible, Dr. Goldstein has to place your implants in the most advantageous way. Careful pre-planning will make it easier to deliver the results you most need. Do you want to learn more about our 360imagine software? Visit their website to read about what changes have been made to their updated edition. And if you have questions about the dental implant process and how Dr. Goldstein can help, give Randolph Dental Care a call. Dr. Goldstein provides implant placement and restoration for patients from Randolph, Rockaway, Mendham, Chester, Morristown, Denville, Morris County, and beyond.